Mum's calling : Science in a novel! It's totally brilliant when one weaves learning into graphic novels. Comic, you may call it. Even more relevant and worth the read when it's based on Singapore's MOE syllabus. 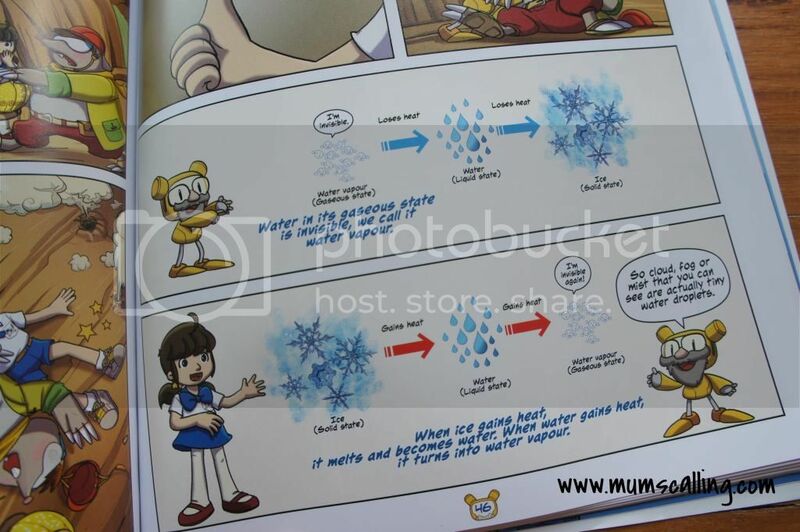 That's how creatively Aurelia from Harvest edutainment had worked to keep science learning children engaged. Jazz may be some years away from doing science proper, but we're always open to learning and gaining knowledge on any subjects. As long as she's curious. When Aurelia sent us her educational comic book, JJ's Science Adventure on heat and light, Jazz didn't wait too long before diving into it. I could tell she was completely captivated with the story and learning points. When I first saw the book, I was thinking out loud on why it wasn't so creatively available during my book mugging days. It was all too interesting! Visual learning and teaching was very much my style, in fact a very effective style for anyone. Combining story, facts and graphics made this an innovative manner to help kids conquer subjects or topics they hold phobia of. I'm pretty sure this will aid any child in comprehending the topics to a better light. Children are awesome when it comes to recollecting stories and graphics, sometimes to the very details! JJ's Science Adventure highlights the characters, Joyce and Jonathon's (JJ) adventure into the World of Heat and Light, where they solved challenging puzzle traps laid by their grandfather to help them learn Science. And of course, some baddies in a novel made it really exciting to follow through. Mr Sinister and his minions were up to sabotages against JJ's mission. Of course, like any fairy tale, it had a happy ending. It then became Jazz's first completed comic book with parental approval. Comics aren't too bad when it comes with good write up and intent. I meant compared to the days I was on Archie, I had to sneak it under desk to not get it confiscated by my then teacher. Comics may come bad or good, but this is one too excellent to miss! Water in its gaseous state is invisible, we call it water vapour. When ice gains heat, it melts and becomes water. When water gains heat, it turns in water vapour. There were many more scenes with learning points incorporated into the novel. These points were boldly highlighted in blue for easy identification. I like that the book ended with two more sections - "Did you know?" and "Challenge yourself." The two topics covered under "Did you know?" were Laser and Bioluminesence. It talked about laser and its application, and I grossed out when it talked about the procedure of LASIK. I had mine done some years ago, but was not ready to get refreshed on it. Bioluminesence refers to the light produced by some living organisms, which takes place through a chemical reaction. Think firefly. "Challenge yourself" included a word search of the key learning words. Fun search you can call it. 3. Leave your name and email on this facebook post. Tag a friend or more whom you think this book will be of relevance to. Winner will have 48 hours to respond, failing which a new winner will be drawn. 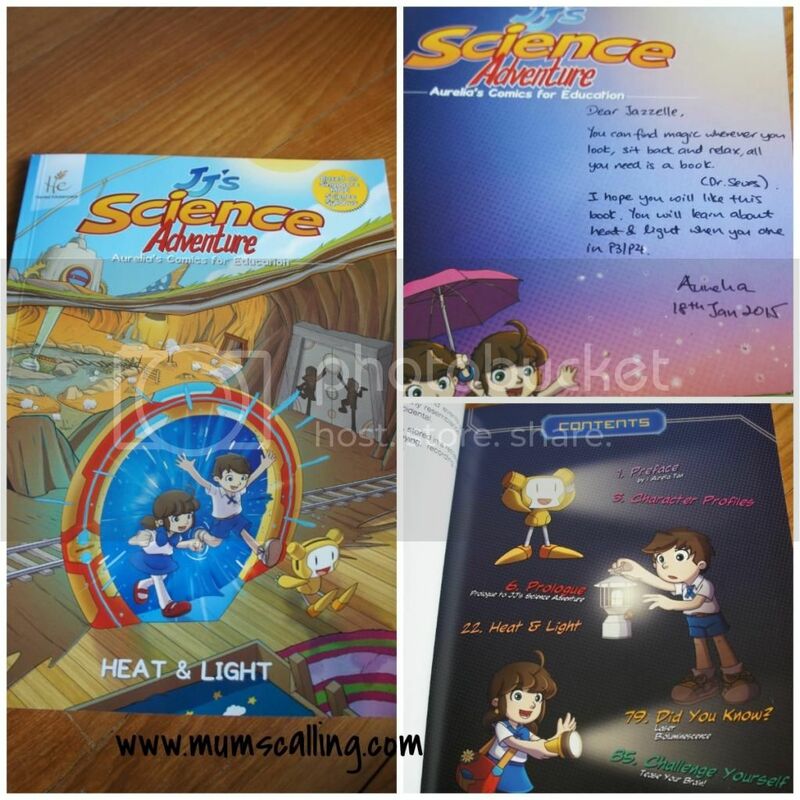 Disclaimer: We were given a copy of JJ's Science adventure, Heat and Light for the purpose of this review. All photos and opinions are solely our own.